The military is a sacred institution and is not for everyone. 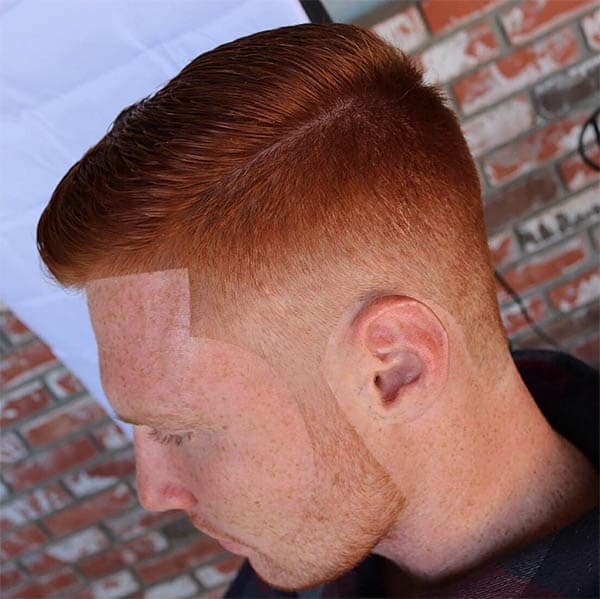 Stay classy and make impressions with any of these collections of the best military haircuts. Cutting the hair short is part of the rites of passage into the military. A well-trimmed haircut attracts respect and attaches a sense of superiority to the military men. While the hair is short and can be styled by any other person, it was exclusively for the military. In recent years, the civilian population took interest in the hairstyles. They are looking for ways to style their hair to the classy military haircut. Although these haircuts have specific features (such as very short length), there are different ways to style them. In spite of the fact that they are not trendy, variations in haircuts such as the buzz cut are now in use for the style. They look good on the military personnel, and the civilian population. If you are looking for inspiration to style the cut, here are 44 ideas to get the perfect cut. A good military cut features short hair and probably faded sides. 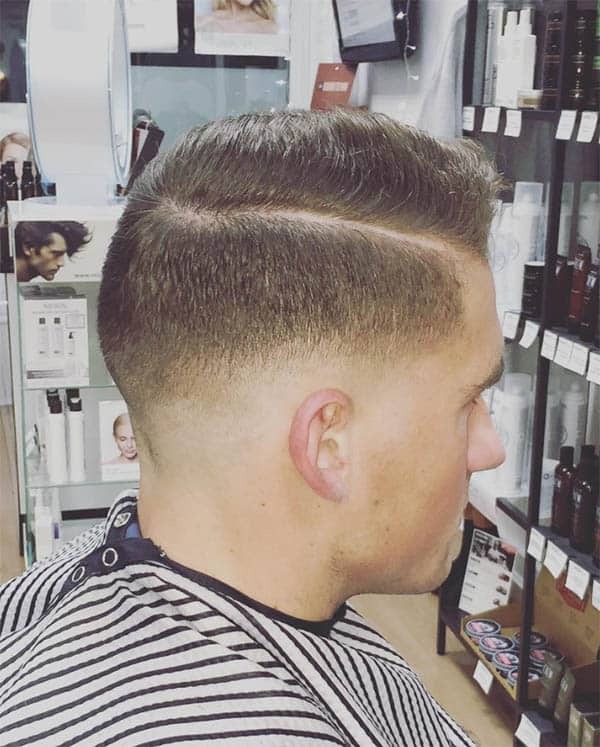 The burr cut trims up to 1/8 of an inch and some fades come in at the sides. The lengthy hair gives you a clean cut. Military personnel are popular for their bold appearance. You can make a fashion statement by keeping a beard off the style. Here is an amazing idea for a military hairstyle. You do not need to keep a messy top to actualize this. The spiky hair makes an incredible military cut if you can style it. When cut short, the spike won’t be visible. You will then be left with some longer strands at the top and follow it up with a trim at the sides. 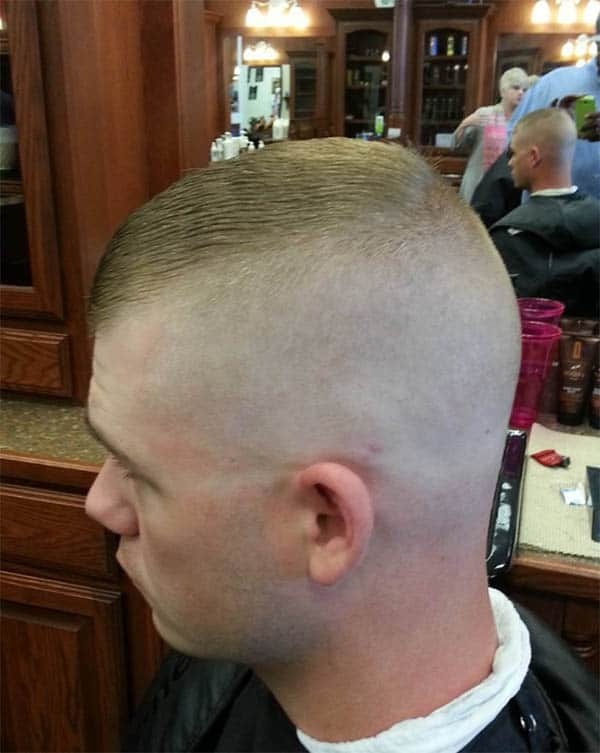 The regulation cut is one of the trendiest military haircuts. The style entails leaving two inches of hair at the top. The top also gets a brush to the sides and an attractive look comes with a razor line by the sides. You can make a lot of impression to your colleagues in the military with this haircut. 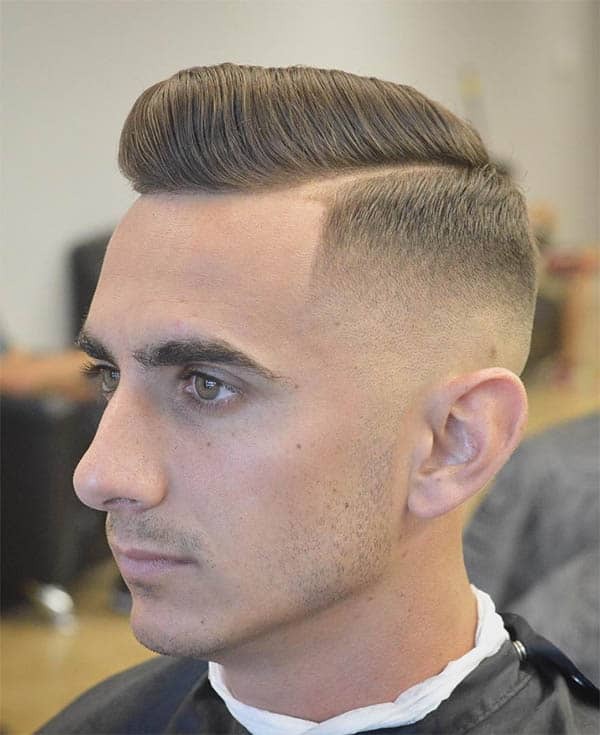 For the civilian population, a skin fade with a comb over is an alluring hairstyle for the bold man. 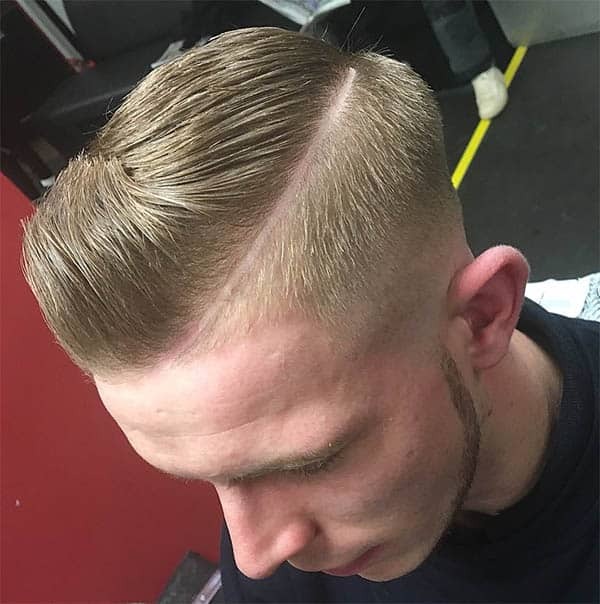 The fade starts midway on one side of the head and finishes with a curly comb over at the top. The haircut for the military man does not stop at being short; a decent top with some fades looks good. You can try out the faded undercut hairstyle for a suave look. 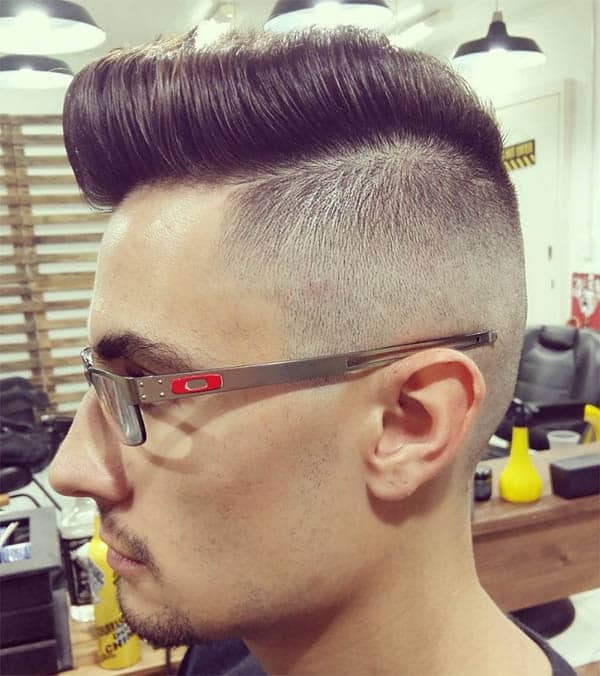 The voluminous top gets some classy touch with styling gels and a medium fade looks nice at the sides. The crew cut is making its way back to the public domain. This time, it looks good on military men when styled with a brush to the sides. The sides and back get a decent shave. Enough hair stays at the top for easy brush or comb to the sides. Because short hair is part of the military dos, brushing your crew cut to the sides keeps the hair shorter. You are to obey the military rule to the core. 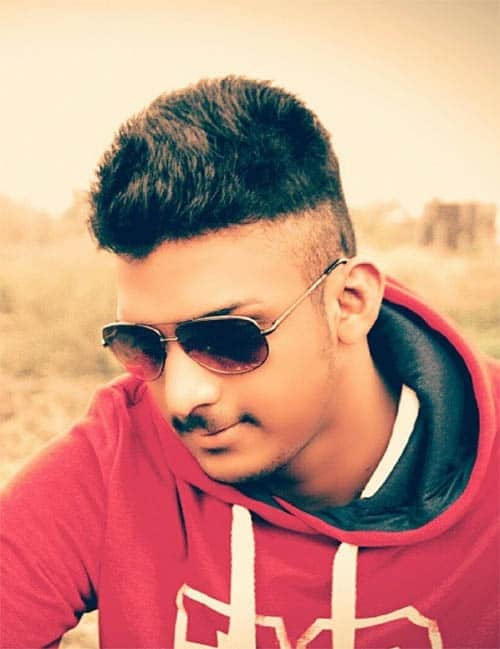 Nevertheless, if you want to try out some adventurous haircuts, a high and flat top is a good pick. A three –inch high top flattens to the front to look shorter. If you love beard, tell your barber to give a round styling that finishes with a moustache. Longer strands of hair at the top also look good but you must be a senior officer to style this. 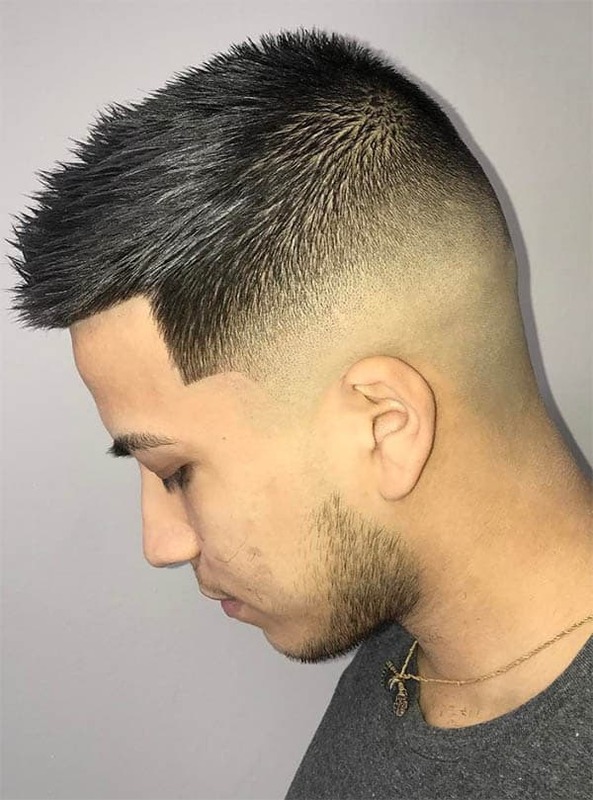 This cut is similar to the regulation cut but does not have closely shaved sides. Rather, the strands at the rear and sides are a little inch shorter than the voluminous top. The top gets a perfect finish with a deep side part. The high and tight haircut can take different forms. 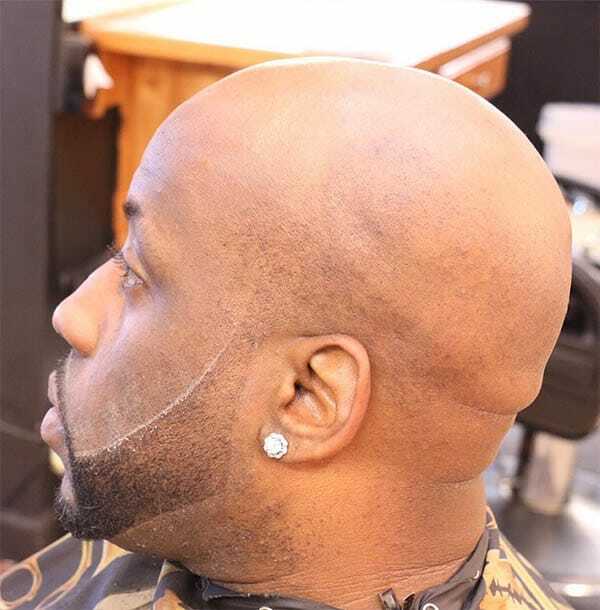 If you do not fancy some strands at the sides, guide your barber to shave them. 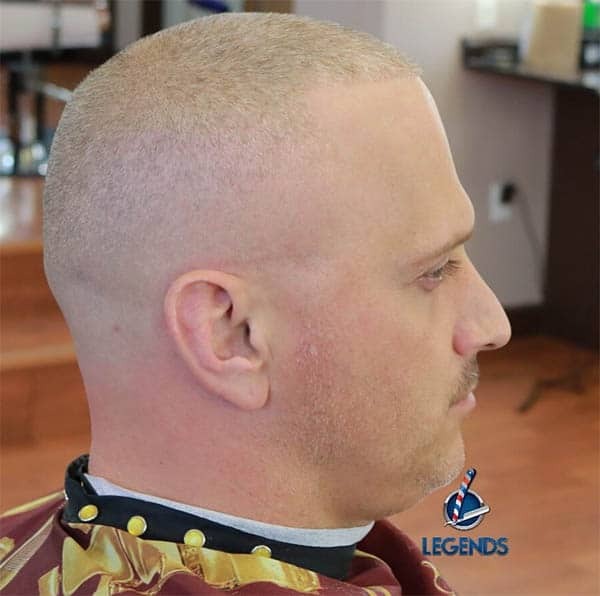 With bald sides, your high and tight top is visible. The back also gets a clean shave. 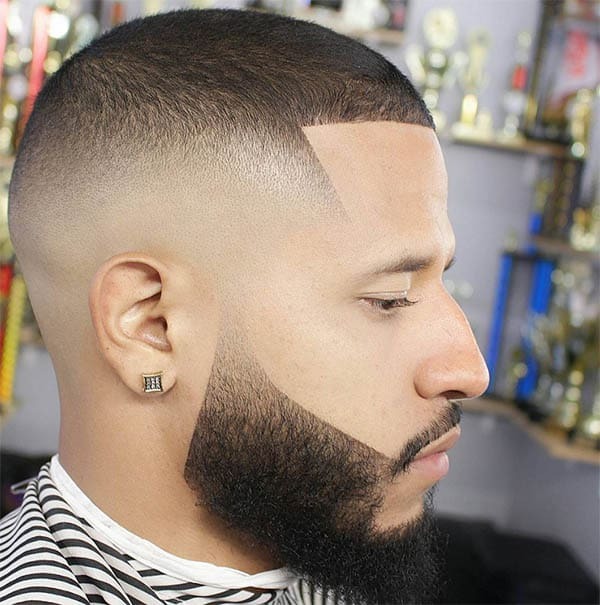 A well-trimmed beard looks nice on this cut. While keeping the strands short, a nice fade at the sides compliments the look. 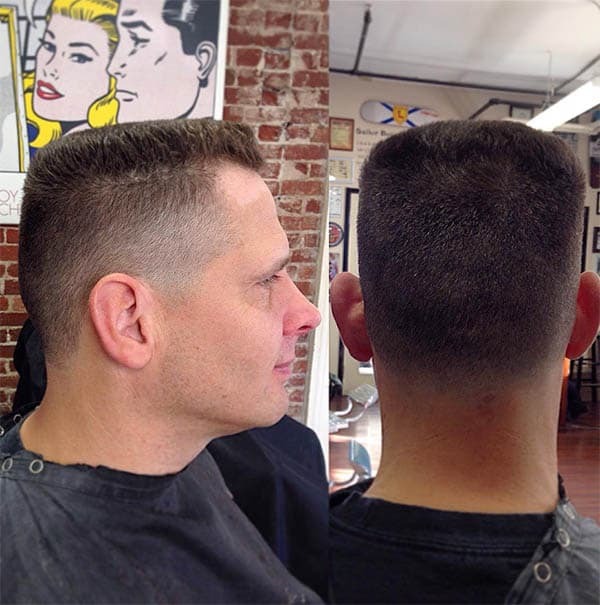 A low fade is a great way to style the military cut. 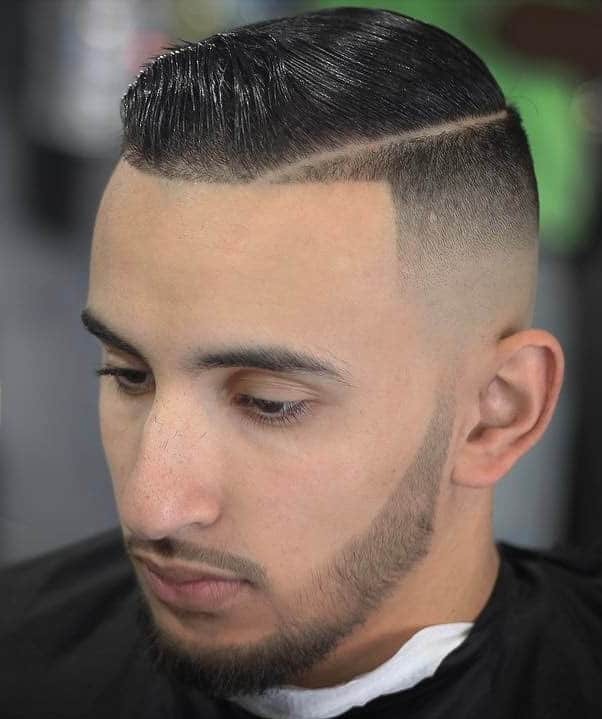 The style also gives you a bold facial expression and a beardless face is a nice way to compliment the cut. If you love your strands long and still want to comply with the military directive, a slicked back hair is the best option. You can rock a pompadour or some high and tight hairstyle at the top. Then slick this back with some fades to compliment the sides. 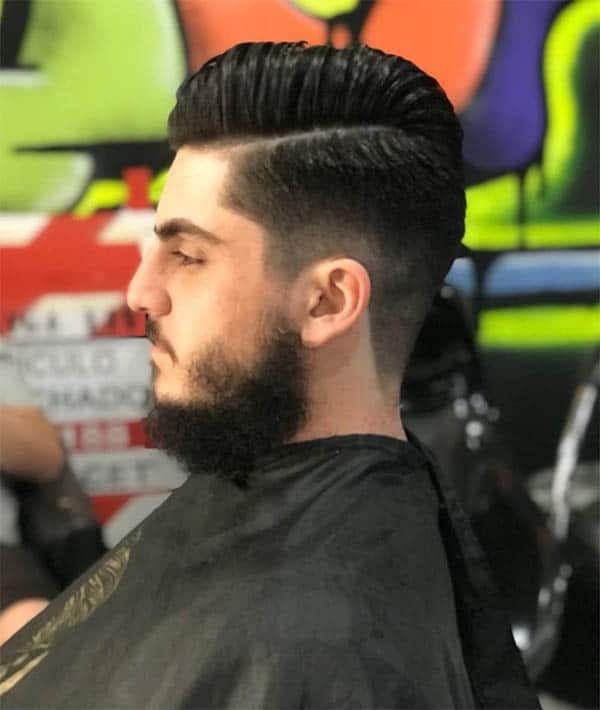 Whether you’re a junior or senior officer in the military, a chiseled hairstyle affords you the opportunity to dine with the high-ranking Generals. The haircut features a medium length hair at the top. This brushes to the sides and a mid fade finishes the job at the sides and temple. This is the cut for the Generals and high-ranking military personnel. A medium length top brush back to meet the low fades at the temple. 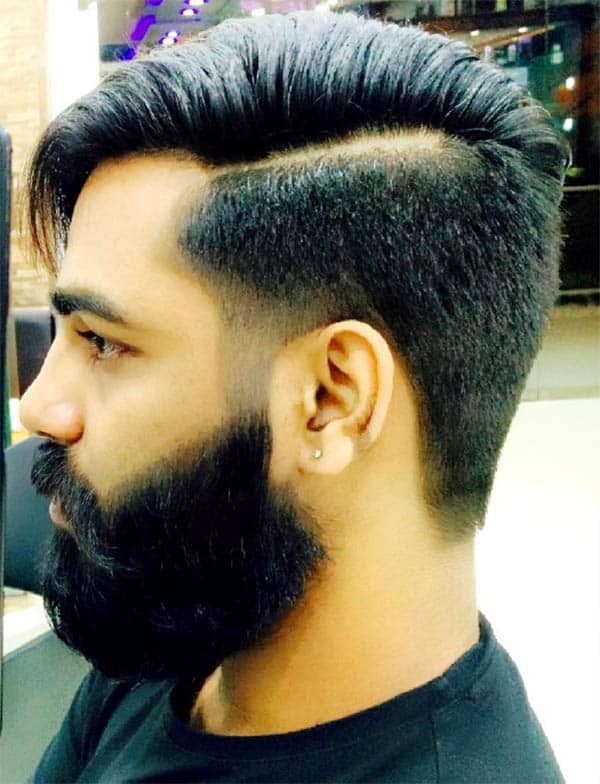 The army-inspired look is attractive with a medium fade at the sides and some trimmed beard. The comb over haircut has different variations. A tight comb over is one of the haircuts you can try for a military-inspired look. It gives the serious look attached to men on uniform and features a low fade at the sides and some low fades that stretch to the crown. The regulation haircut is not just short; you can try the longer top. If you don’t want to look dull with shorter strands, the detailed and longer strands at the top is what you should look out for. The styling gets a boost with a neat low fade at the sides. The buzz cut has other variations. You can actually have bare hairs at the top and some beard to compliment it. 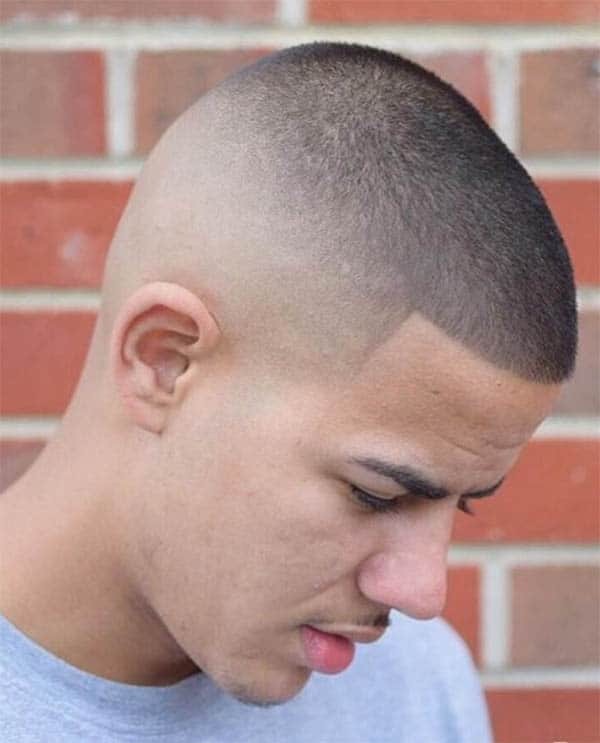 If you are on the lookout for a simple and stylish military hairstyle, the bare buzz cut might be what you need. A neat side with some spikes at the top is another dimension to the military-inspired haircut. Have in mind that you are pitching yourself to be a rebel in the army as the spikes have longer strands than traditional short hairs for men on uniform. The hair at the top is a boost to your confidence (that is if you’re shy). Look exquisite without your hat. The crown soldier cut sits well on the hair and is one the choicest picks for men on uniform. While it entrusts power to your appearance, the cut also gives you extra confidence. A well-faded side and undercut is a nice way to place this style. Don’t try your hands on this style if you’re still in the junior cadre. This is for accomplished men on uniform. This is no Mohawk but a quiff with shaved sides. This cut is for older men in uniform and after shaving the sides, the medium top slicks back in a thin line. If you love the spiky haircut and want to try something new with it, consider rocking it with a flat top. A flat top military style with spikes looks good with low fades that stretch across the sides to the back and then to the crown. The buzz cut looks nice with some nice shaving. 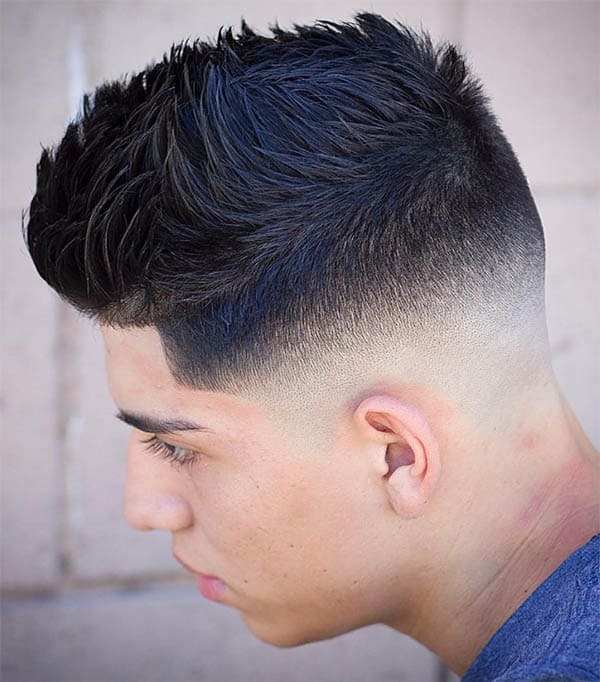 With skin fades at the sides and back, the top tilts forward and finishes with a nice carve. A beardless face is a better way to wear this haircut. Men on uniform look good when they have neat haircuts. 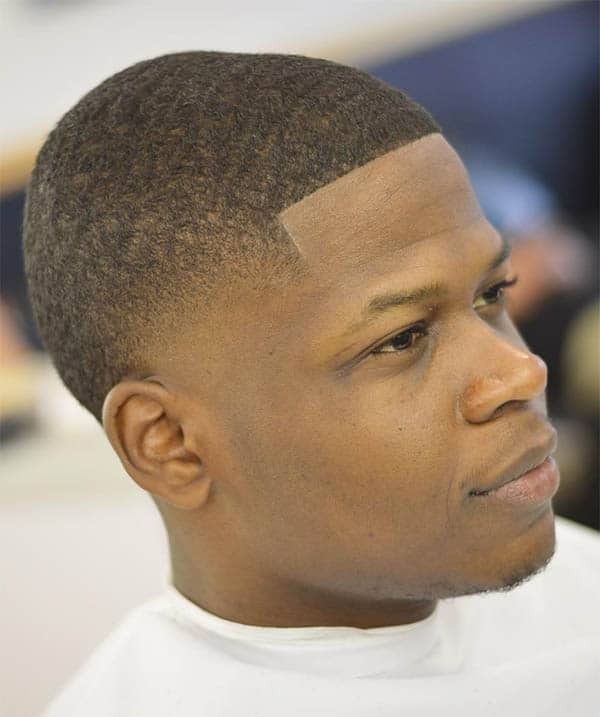 However, you can try the messy and tapered cut and still look professional. The style looks great on people with wavy hair and a good hair product should be handy to keep it in shape. If you’re inspired by some trendy military hairstyles but your hair is too short to style them, don’t be upset. 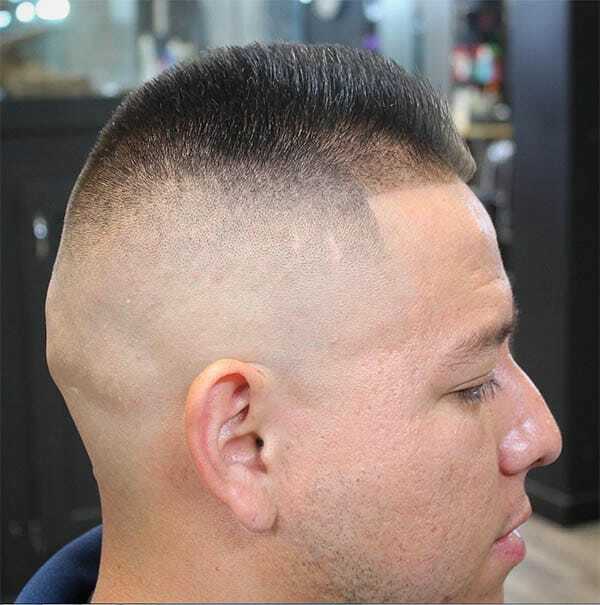 This forward-combed Mohawk haircut with shaved sides will look good on you. The side swept hair looks good with the base haircut. 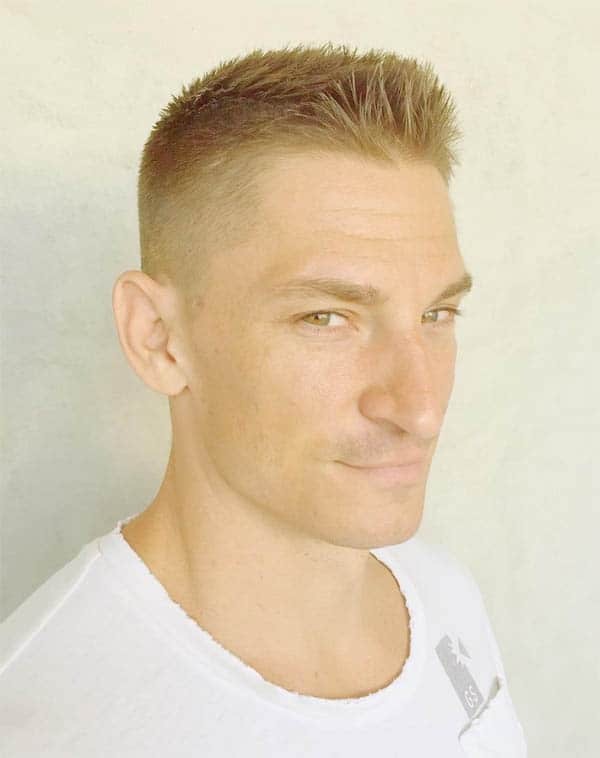 The regular military cut takes a variation with the addition of a side part and a base hair on one side. The top can style to a pompadour but remember to shave the sides to complete the hairdo. This style takes you back to the vintage haircuts of men on uniform. 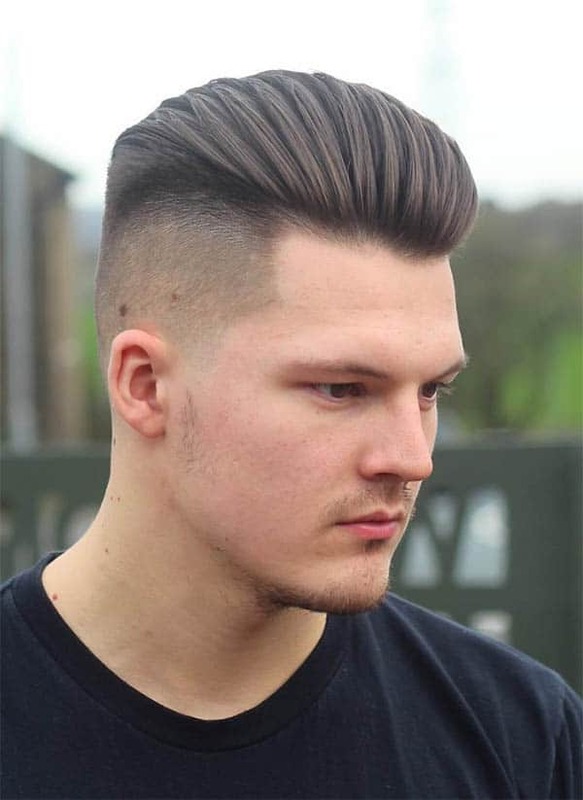 The longer strands at the top style as a tuck-in and finishes with a low fade at the sides. You can add some razor line at the sides to perfect the hairdo. 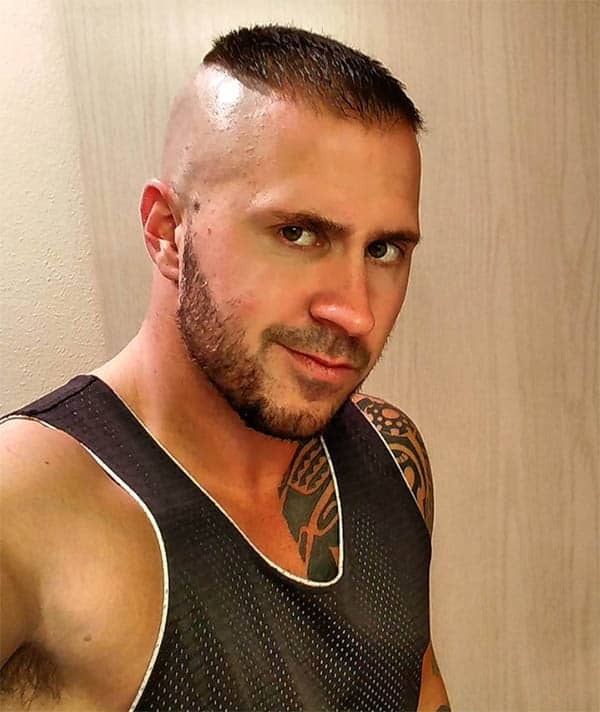 The Butch cut looks neat with a military-inspired hairdo. The wavy hair at the top forms a mini ponytail that drops at the crown. The closely shaved sides extend to the back. There are no dull moments with a nice haircut. The military-inspired cuts add some flavor to your carriage and personality. 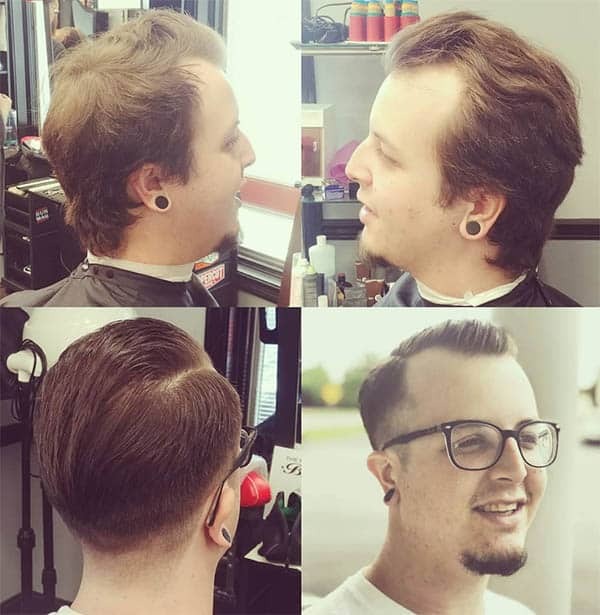 Another unique feature of the cuts is its styling to different haircuts. A messy top looks good here but a great deal of styling expertise keeps the longer strands at the top together. The induction stage at the military is a time to get your acquainted with the dictates of the force. 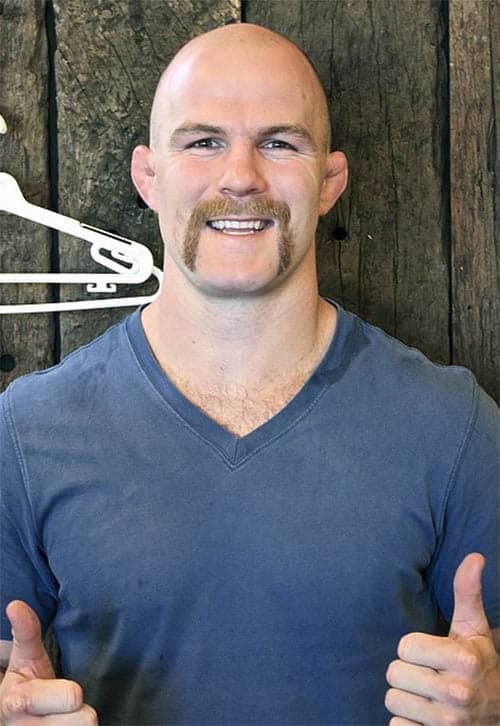 If you’re at a loss on what haircut is permissible, a bald induction cut with some round moustache will do the magic and get you a nod to clinch the uniform. The pomp haircut is another way to style the military cut. 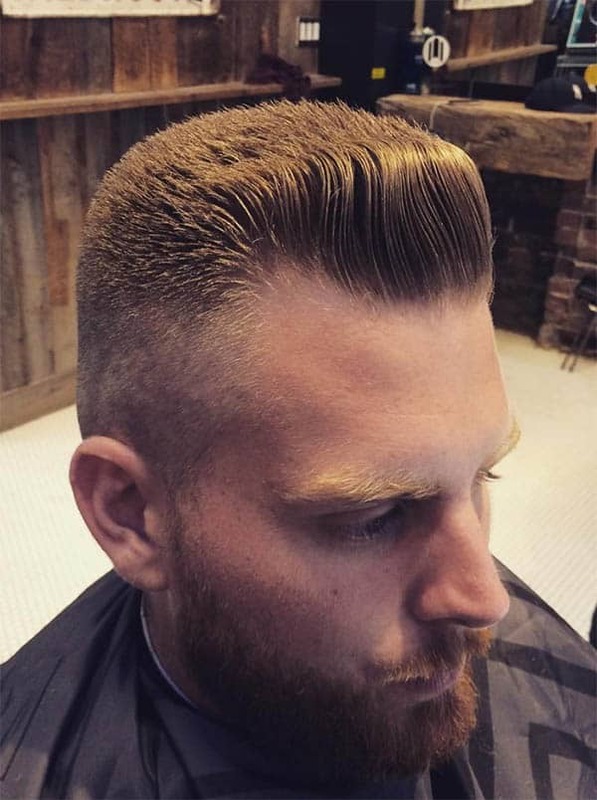 Longer tapered strands at the top and a razor line at the side give you the military-inspired pompadour haircut. Tapering the sides or keeping them on the low gives an alluring look. Traditional military haircuts look good with shorter strands of hair. For a simple version, go for short hair that is about a quarter inch at the top. 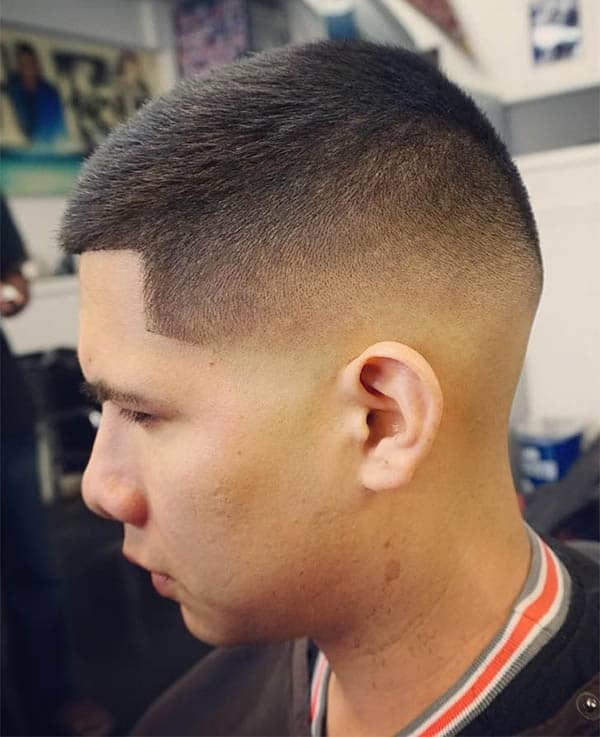 Skin fades can come in at the sides down to the nape. Take charge and issue orders to junior officers. Your badge does not only count; your retro haircut is another medium of authority. 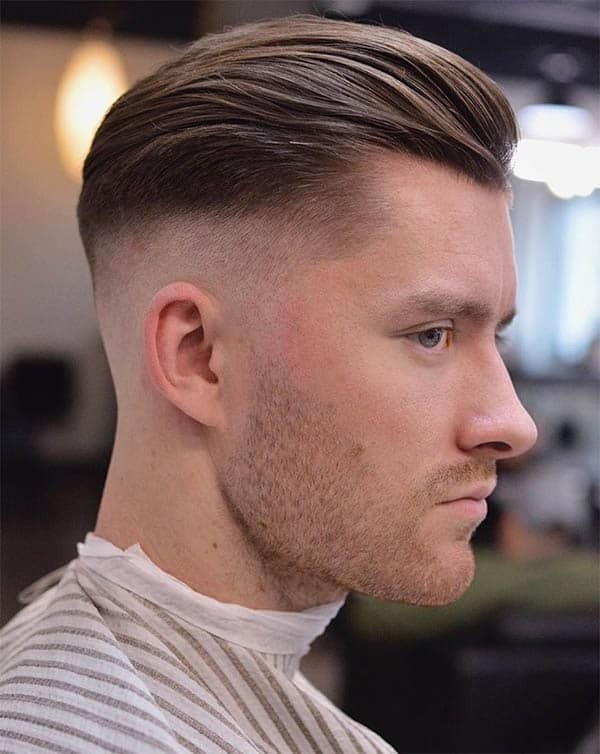 This haircut does not go out of style and you can pull up the front quiff. The key to getting this right is slicks at the sides and adding a razor line at the side. A front swept hair is a nice trend in the military-inspired haircut. 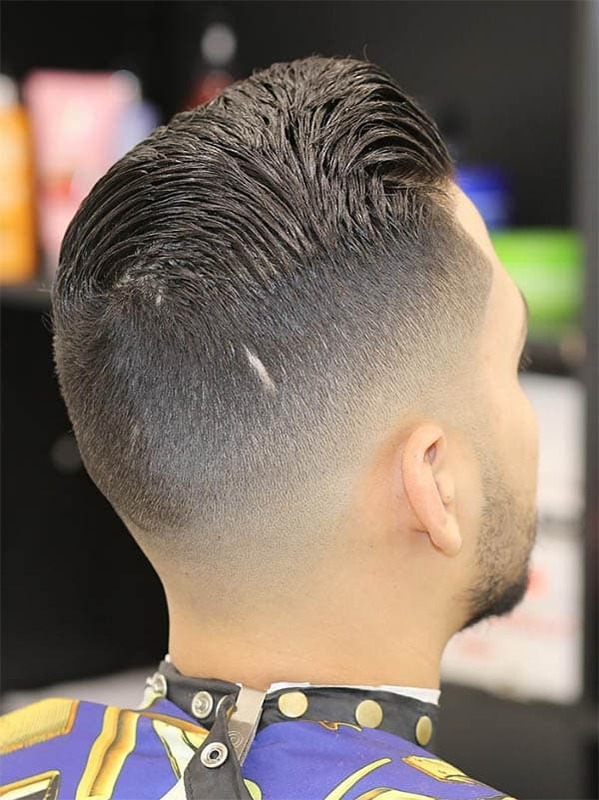 The style sits comfortably on wavy hairs and well-tapered sides compliment the look. A medium beard that starts below the jaw is a nice way to look good on the uniform. 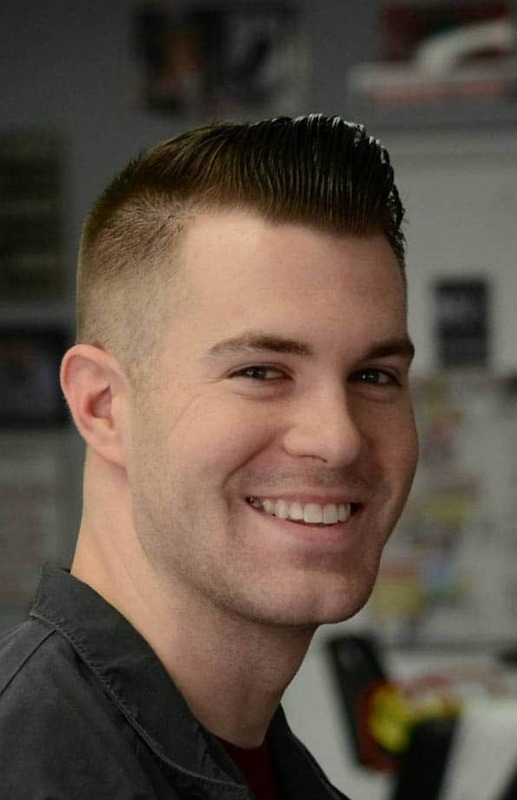 The pompadour hairstyle never goes out of style and makes a comeback on the military haircut. The center of attraction is the neatly styled pompadour at the top. 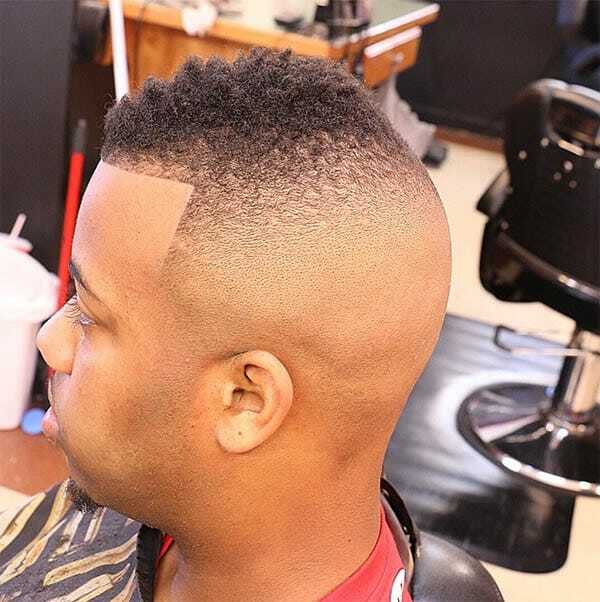 The haircut gets a boost with low fades at the sides. The crew cut looks smooth because of the medium and coordinated top. 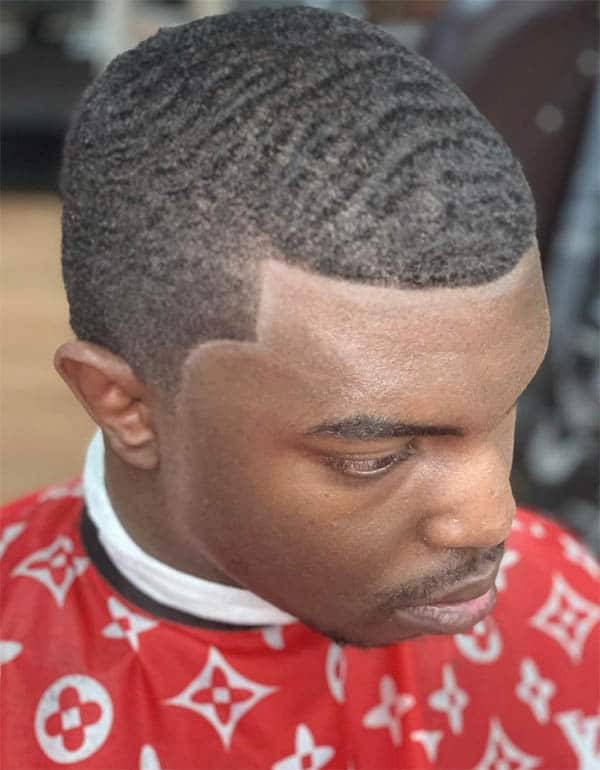 It looks good on wavy hairs and a medium fade few inches away from the front is a necessity for the overall perfection of the cut. The burr cut pulls off better with extra short hair at the top. Apart from being a nice way to style thinning or receding hairlines, the cut can take a different approach with the military inspiration. A line up and a skin fade are necessary additions in boosting the beauty of the cut. 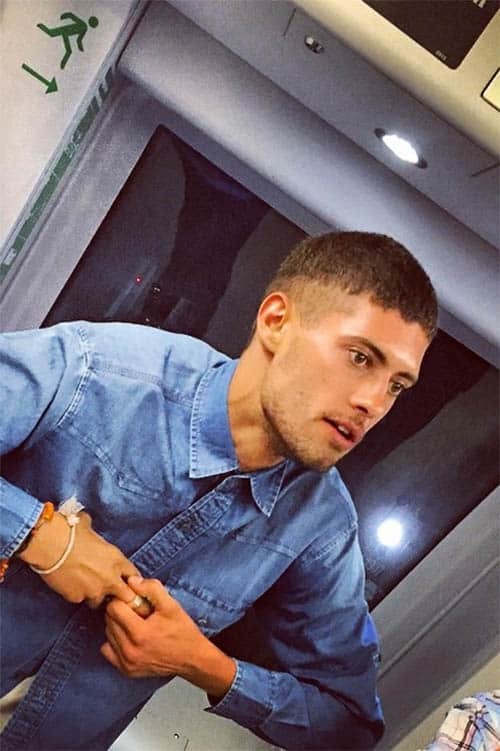 The crew cut looks good with curly and wavy hair. 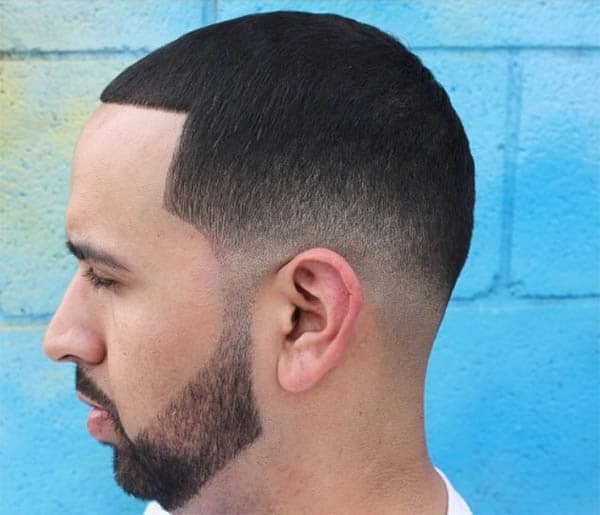 For the curly crew cut, create a smooth oval cut at the top and shave off every strand at the nape. 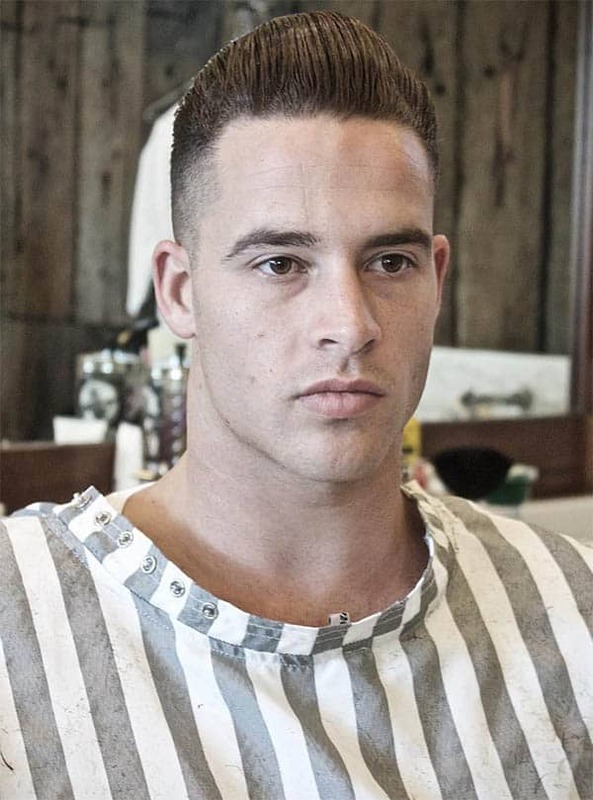 However, you can leave the sides with a skin fade. The undercut looks nice with medium strands at the top. Despite the fact that the style is better off with longer strands, you can sleek back your medium hair to achieve the perfect look. A side part is the style of the younger men. However, older military men can rock the parting some base hairstyle. To achieve this, create a base to one side of the crown and run a deep line by the sides. A low fade at the sides drives home your appearance. This style is in tandem with the traditional military hairstyle – “keep it short”. 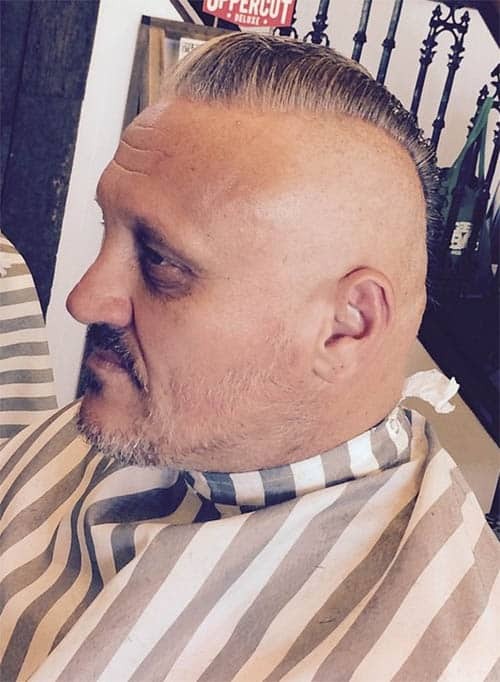 The haircut features straight lines that stretch from the temples down to the sideburns. 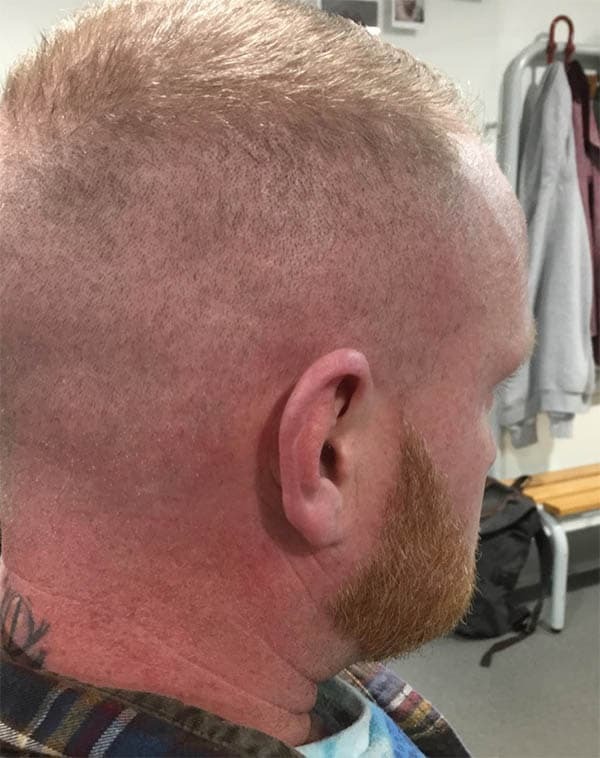 The low fade disappears down the back of the neck. Think of a haircut that stands at attention when you’re before your superiors. 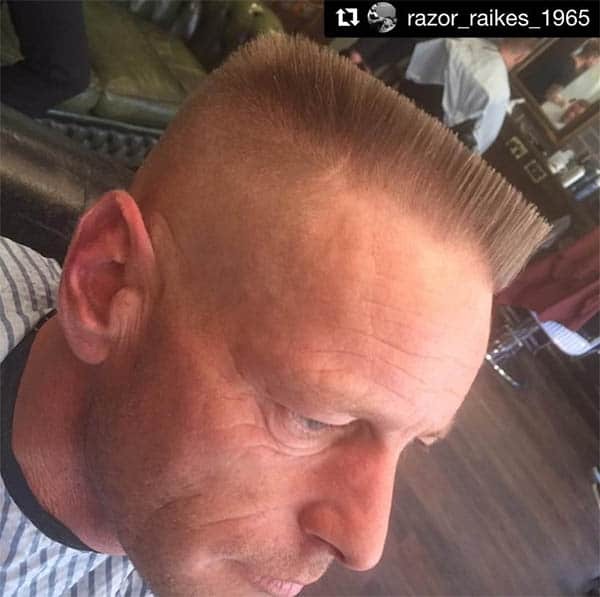 The classic flat top is the style! The cut comes from the American army of the ‘80s and has been in trend ever since then. 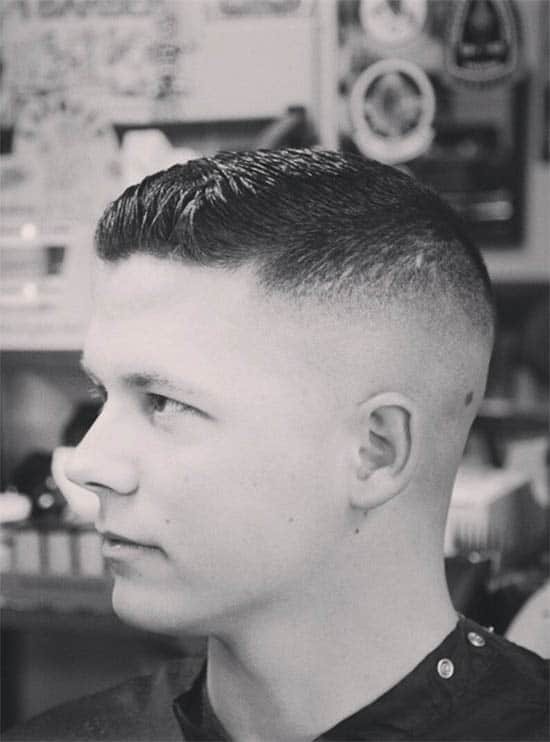 A medium flat top and tapered sides gives you a synonymous look to the men on uniform in Hollywood movies. 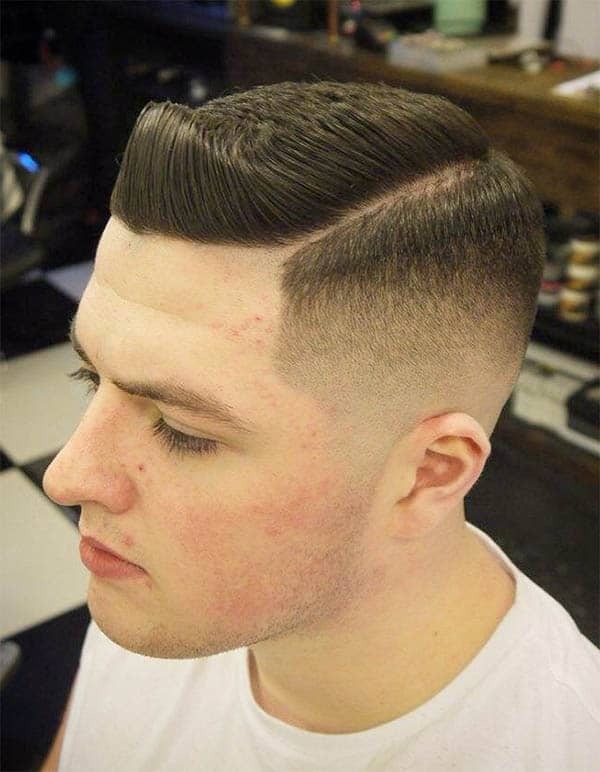 The mid fade hairstyle comes in with short haircut. This smooth haircut looks neat with coarse or straight hair. This easy-to-style cut is for man with authority and the shaved sides add glamour to your look. 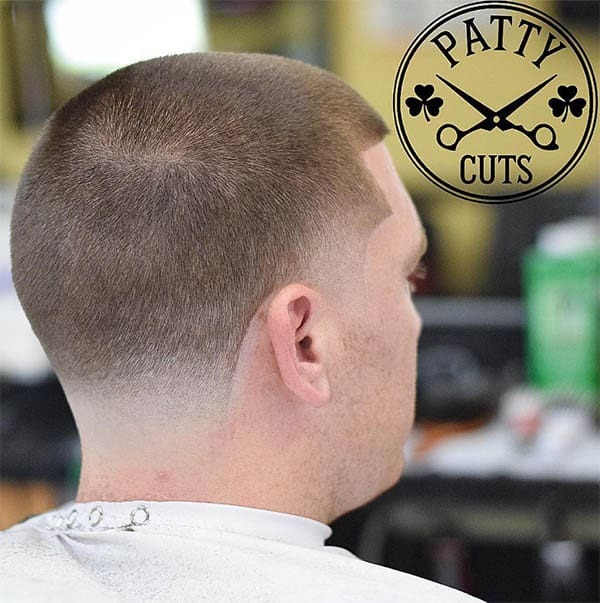 The traditional military cut features a line up. The front can have a straight forehead line and finish with angled temples. 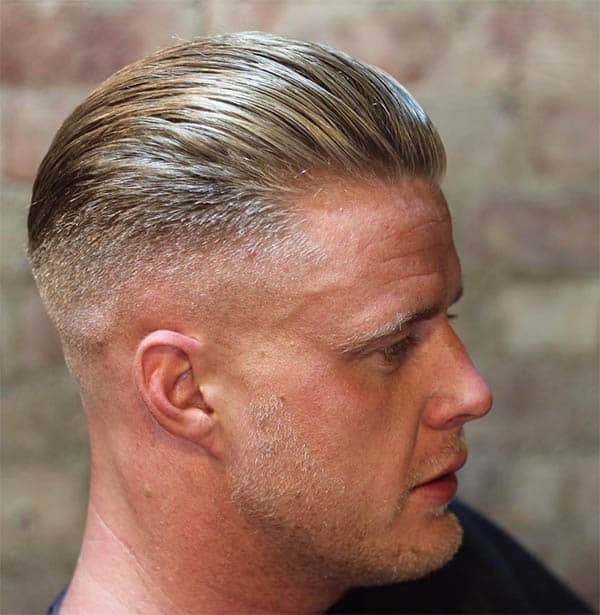 A side parting differentiates the medium top from the tapered sides. The comb back is a good way to cast doubts about the exquisite look that comes with a military-inspired haircut. The front and back strands get some tapering and as the medium front sweeps back, the sides finish the job with low fades. 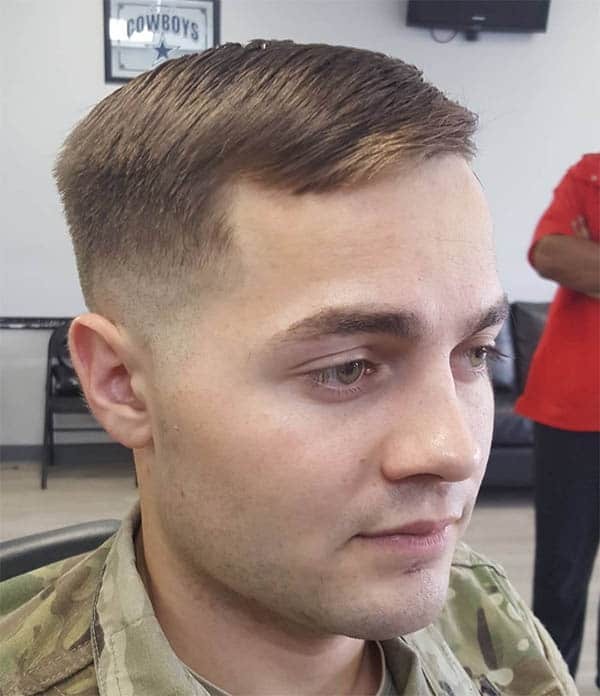 A medium length haircut is acceptable in the military. A blow dryer keeps the strands in place and you can add some skin fades from the sides to the crown. The military is not just an establishment that offers security to the civilian population; it is also a place to learn the latest trends in fashion. From the uniforms to the hairstyles, there is no doubt that the military is a vast empire for fashion lovers. 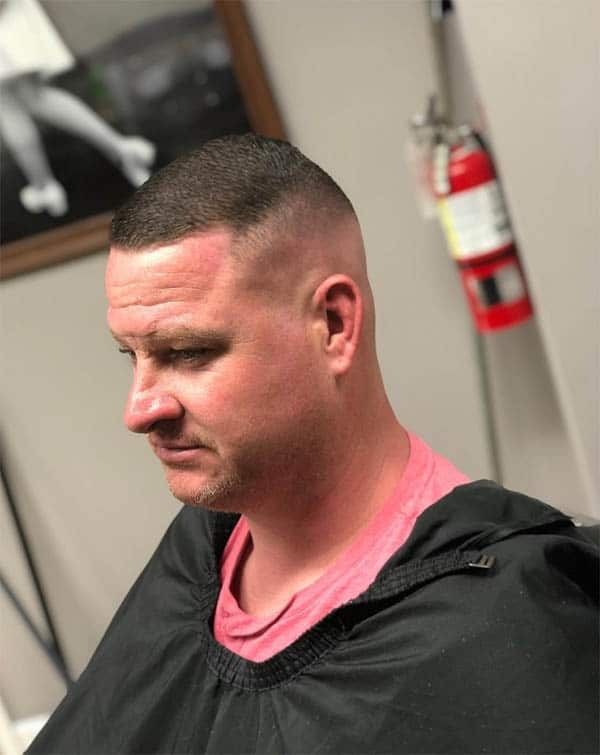 As the civilian population takes interest in military-inspired haircuts, they inch closer to getting an induction to the force. 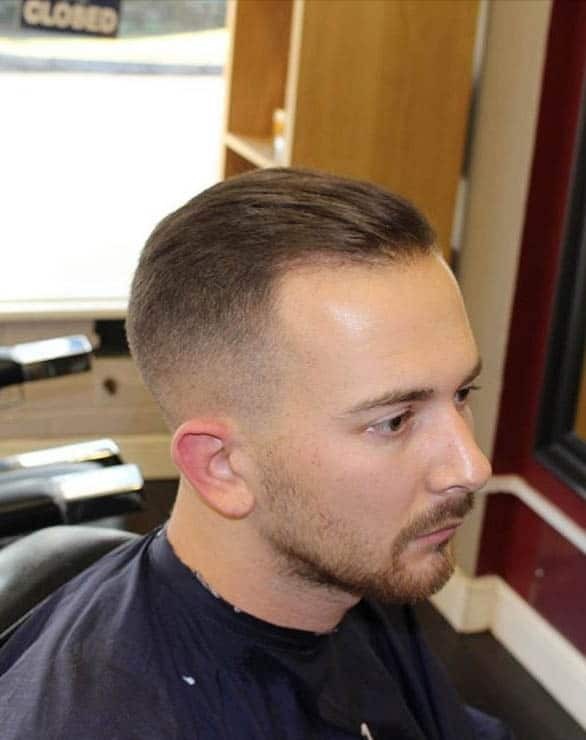 Whether you wish to pass the retinue of being military personnel or you simply want to boost your ego and command respect, a swipe at any of these military haircuts is a great way to start your journey to recognition.